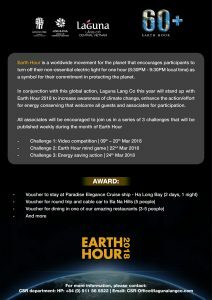 Earth Hour is an annual campaign of Laguna Lăng Cô, started with the aim of highlighting sustainability issues. 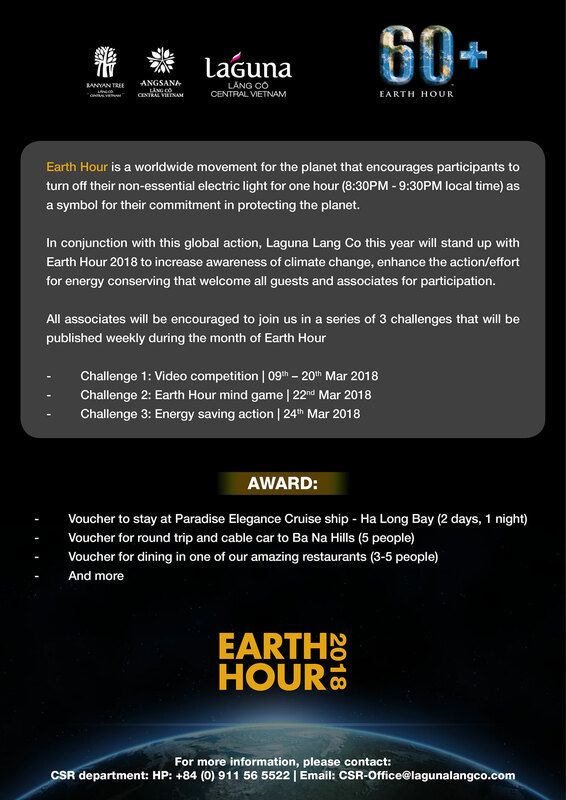 By participating in Earth Hour to promote awareness about climate change, Laguna Lăng Cô inspires and mobilizes all associates and guests to take action on climate change. 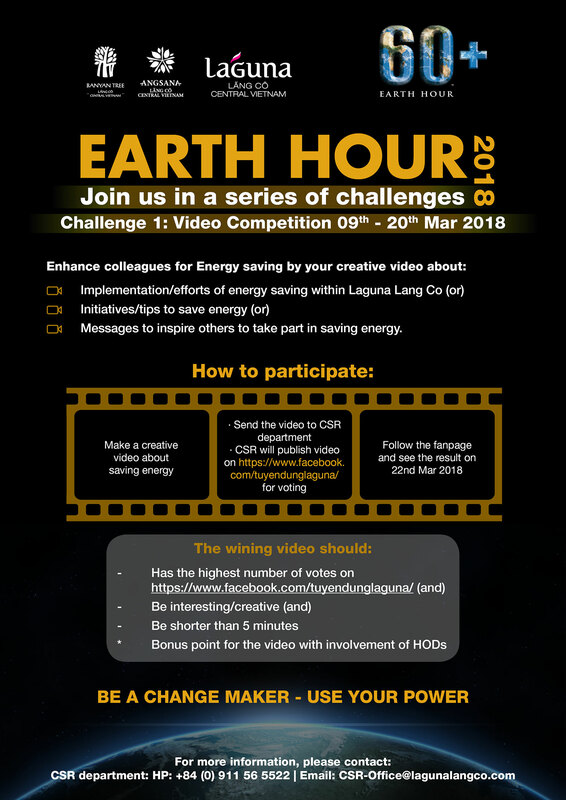 In conjunction with the annual global climate action event Earth Hour, the Laguna Lang Co CSR team will continue supporting Earth Hour 2018 to increase the awareness of climate change, and enhance the actions and efforts for energy conservation. 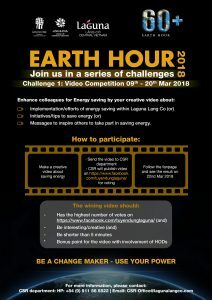 With the theme: “Be a change maker- use your power”, the campaign this year will be extended to a series of three challenges that encourage the power of knowledge, creativity and speaking out from all Laguna Lang Co staff to help make a difference. 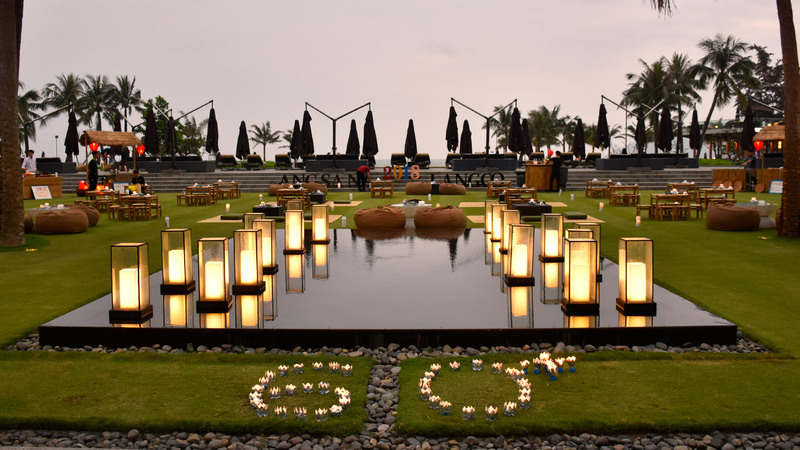 Join a special dinner that utilizes no electricity at Angsana Central Lawn from 6pm. In 2016, Laguna lăng Cô encouraged hotel guests to turn off non-essential lighting and participate in special fire-lit BBQ dinner with no electricity organized in the evening. 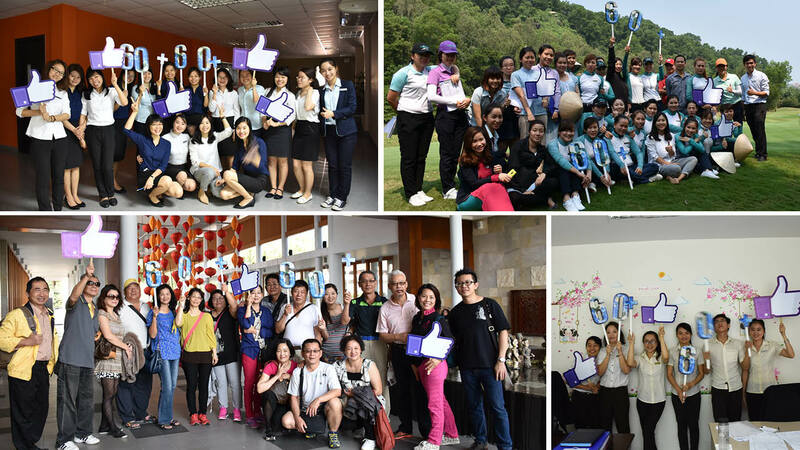 In addition, associates were motivated to save energy by conducting meetings in sunlit open area instead of indoor, and by following the energy saving tips posted around office and back-of-house areas. 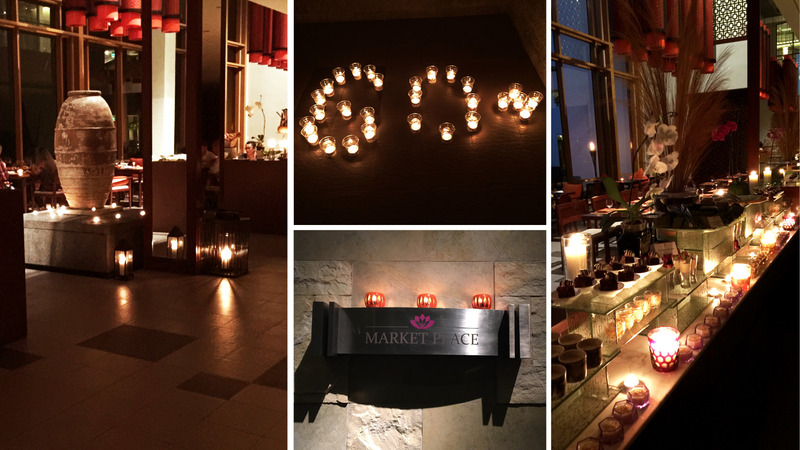 Associates from all departments participated in the activities and 77 in-house guests joined the candlelit BBQ dinner. 4950kwh (equal to US$544) of electricity was saved. 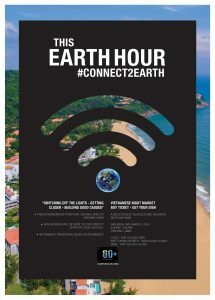 Hotels’ guests were encouraged to join in this meaningful event by turning off non-essential lighting in certain areas from 8:30pm to 9:30pm on 28th March – the main day of Earth Hour. There was also a special fire-lit dinner with no electricity organized at Moomba Upper Deck for guests in the evening. 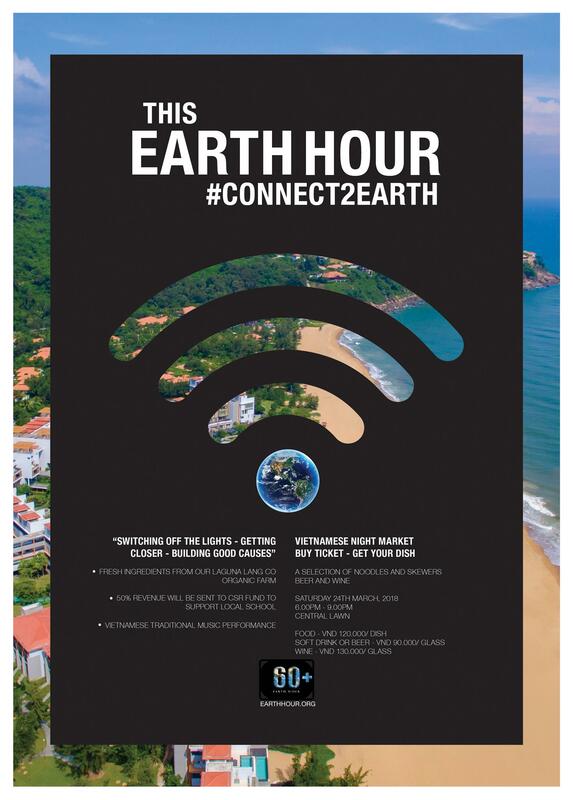 Besides, associates were motivated to try to save as much electricity and water as possible between 27th and 29th March by following the tips posted around office and back-of-house areas.